If you've been following myArmoury for the past year you couldn't help but notice that there's a new player in the area of medieval replica swordsmithing, working in Poland. After only a couple of years of practice (hard to believe but so he says) Maciej Kopciuch started posting his work here, turning out fine quality replicas at a very high rate. He started showing some earlier medieval models but has covered pretty much the full range of the medieval period in the past year. His work reveals a good eye for historical detail and the talent to realize his vision in steel. He also makes quality scabbards to go with his pieces. I contacted Maciej over a year ago and we agreed on an historical piece to replicate, but the timing was not then right for me. After some back-and-forth, mostly on my side, the stars have finally aligned and this is going ahead, with an estimated completion time in the early Spring of 2016. The project is based on a sword that was apparently sold by Christie's in 1991. It's a classic Brazil nut design with fairly large proportions (blade 88.4cm. Overall Ilength 102.3cm). The blade would be classified as an Oakeshott X transitioning to Xa. 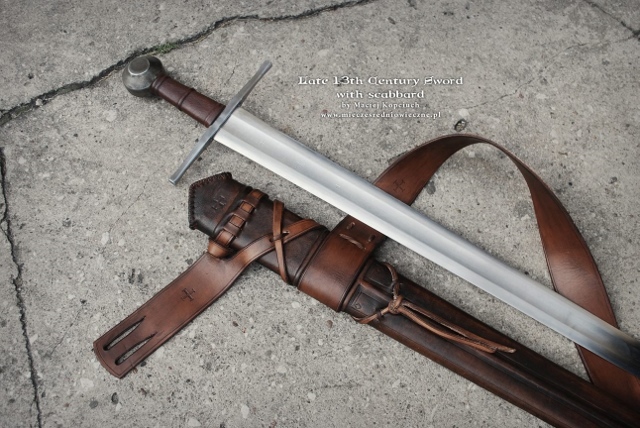 Its hard to date such swords as they were popular from the end of the 10th century through the 12th century, perhaps even 13th in some regions of Europe. However this sword has a few features (rather strong profile taper like an XII, curved cross, and rather long grip) that might put it safer in the later period; 12th century. There are also some partial large inscriptions framed by crosses on one side of the blade that might help in the dating if one has expertise in that area (I don't). This will also come with a scabbard. One thing I am not sure about is the grip length. Maciej originally estimated 105 mm. I know that a shorter grip (as one finds in most such swords) works best with my hand size and a Brazil Nut pommel, allowing one to leverage the pommel against the blade's weight in both the hammer and handshake grip (I've always suspected that this was the intent of their design). However, looking at comparisons with the original, 94 mm seems visually out of balance. Maybe 100 mm would be a better compromise? I'm not sure. Let me know if you have any comments and I (or Maciej) will post updates when the come. That is going to look really nice J.D. Maciej's work is really impressive. I look forward to hearing your report on it when you do receive it. I really need to fit something into my budget from him. I think this will be a great project and you will really like working with Maciej. I'll be happy to follow the sword's progress! I haven't worked with Maciej on a direct commission like this but I was fortunate to buy some of his work last year and I really like it. Standout work for sure I believe. We did not discuss this; I'm not sure if he'll be able to do it on the budget that I gave him. I respect your opinion on the grip length. I also realize that shortening the grip conflicts with my most recent instruction to Maciej, which was to 'keep it like the original'. So I guess I could go with the longer grip. The full measurement on Maciej's design must be wrong: the hilt can't be 21.7 cm long. Maybe a typo? The hilt measurement I derive from the auctioneer's measurements is 14CM. Also, the design seems to be a bit bulkier in the hilt components and less profile taper in the blade; that would add some weight and make the sword a bit more sluggish than the original. Maciej, do you see this? I ran into some problems last year on another custom project where the museum measurements were wrong and we did not have a full profile photo. Fortunately this time there are some good profile photos, so as long as the design matches the photo it should all work out right. When you have this sword in hand, you must tell us all about it. That's a great shape on the brazil nut pommel. There are more variations on that type than one might think. I wonder how much of a distal taper artist is he on these High Medieval cutting swords? I can't remember if we discussed this, but on this type of sword I would expect a taper from 5mm near hilt to about 2.5 mm past the fuller, dropping quickly near the point. I like a sword to start a 6 mm myself. That gives the smith just a little more room in which to get creative. I prefer the type A brazil nut to the Type B1 tea cozy shape on these earlier models. It's much easier on the hand it the near side of the pommel curves away from it, instead of the right angle on the tea cozy. That sword looks great cant wait to see the finished sword I am sure it will be an work of art as most of his swords are. I also have a sword from Maciej and it's pretty awesome piece. I'm posting the images that he shot,because of the quality. P.S. My sword was based on one from Christie's too,sold long time ago and now in private collection. P.P.S. 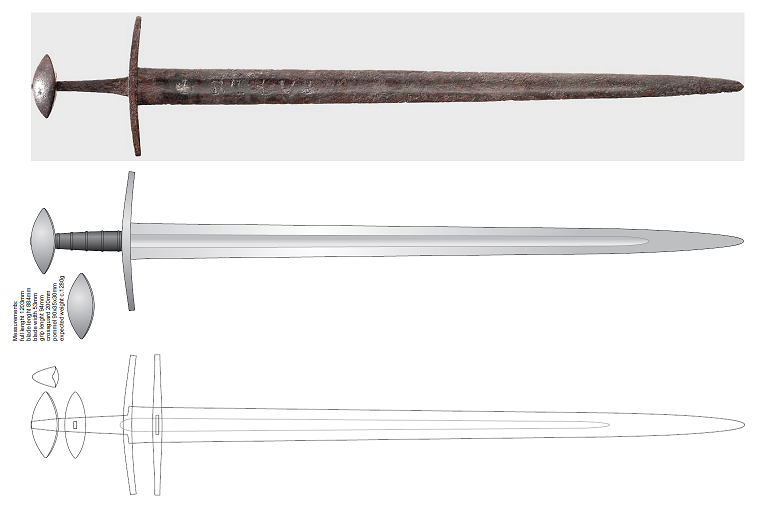 Dating of the sword is mistaken by Maciej,it's 13th century,instead of 12th. I like that piece very much. At first glance is similar to one of mine (in the avatar to the left) but it has a more roof-shaped top on the pommel, whereas my type O is more boat shaped. Yours also resembles a Swiss sword and one of the Naumburg sculptures. Thanks for the enthusiasm everyone, it makes me glad I made this choice. Its not easy to decide where to allocate funds these days. Yes,my sword's pommel is type N,a bit earlier than type O.The "roof top" is narrow,instead of curved. The blade is 30inches long and massive.Even my poor hands are feeling the power and potential of that weapon. Once again congrats about your choice for Maciej. Viktor, how much does your sword weigh? How well does it handle? Does it feel good to wield it? I would guess that the Point of Balance is fairly far down the blade. Are you after a replica of the original, or a version of the original tuned for you? The owner of the original might have had much larger hands than you, and his 105mm scaled to your size might well be 94mm. Myself, I'd fit the sword to me, and I'd be tempted to go down to 80mm. It wouldn't look like the original. That's exactly my conundrum. Its interesting that you made this comment about hand size because I said the same thing to Maciej. So do I ask for a sword made for a guy with large hands, or for the sword that I would have bought 1000 years ago? Which approach is more historically accurate in this case? In a historically accurate meaning of "historically accurate", you'd get the sword made to fit your hand, not somebody else's hand. Especially for Viking swords, it matters a lot for handling. I think this extends to Brazil nut pommel swords as well. But then it isn't a replica of the original. Better than a replica, as far as function goes, but if your goal is a replica, not so good. Personally I would want a sword made to fit my hand closely based on a particular original otherwise, or drawing from sources otherwise as I think he has done for mine. I suppose if you want an exact replica for a living history function, or a museum exhibit, that would be a different thing altogether. Good distinction Timo. If you are interested I can get some other dimensions sometime this week. I got a 20 dollar set of digital calipers so I could find out distal taper of swords. It is interesting. Well,the sword weights 1200gr. and it handles very well. I'm not a trained one guy,but it doesn't tire my hand. Point of the balance is very well precised,a bit below from center of the blade towards the crossguard. In conclusion - that is a heavy and powerful sword which maneuvers fast and doesn't beat your hand. thanks for the special topic, J.D. actually I was quite busy last time with my family business, that why I couldn`t work as usual. I hope I will be able to share some pics very soon because I`m working on this sword too. There is no need to apologize Maciej, we're used to waiting a year or years for a custom project to be done! The new English web-site looks great. And lots of medieval replica eye-candy to look at.